I’ve always enjoyed this read-a-thon in the past, so I’m excited to do it again this summer! I haven’t figured out what my personal goals will be yet, but I’ll be posting them shortly before the event kicks off. There are over 200 participants, so clearly all the cool kids are doing it. Click here to sign up! Aww, that’s too bad, but I do understand. 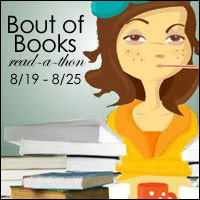 This is a fairly low-effort read-a-thon, though, so don’t feel pressured to read a ton if you do feel like joining in!